A weeklong referendum to determine independence began on Sunday in southern Sudan. Civil wars have marked Sudan’s history for decades as Sudan’s southern region has fought against the government in the north. The oil-rich region in the south has been given a chance to vote to secede to form a new nation as a result of the 2005 US-brokered deal to end the latest civil war. Violence broke out on Saturday along the north-south border near the region of Abyei—a disputed area. This map (click to enlarge) available from the GIS Research and Map Collection (GRMC) in Bracken Library marks the north-south border with red arrows. 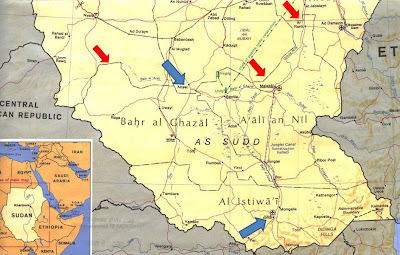 A blue arrow shows Abyei, which has been the site of killings in recent years. Juba, the capital of South Sudan, is also identified. The GRMC includes several historic and current thematic maps of Sudan and detailed maps of Darfur, another disputed area of Sudan. The Map Collection includes vegetation, geological, road, and topographic maps of the country and Khartoum. Maps of Sudan have not been cataloged, so researchers can visit or contact the GRMC to learn about the range of maps available. All maps from the GRMC circulate for two weeks or longer.